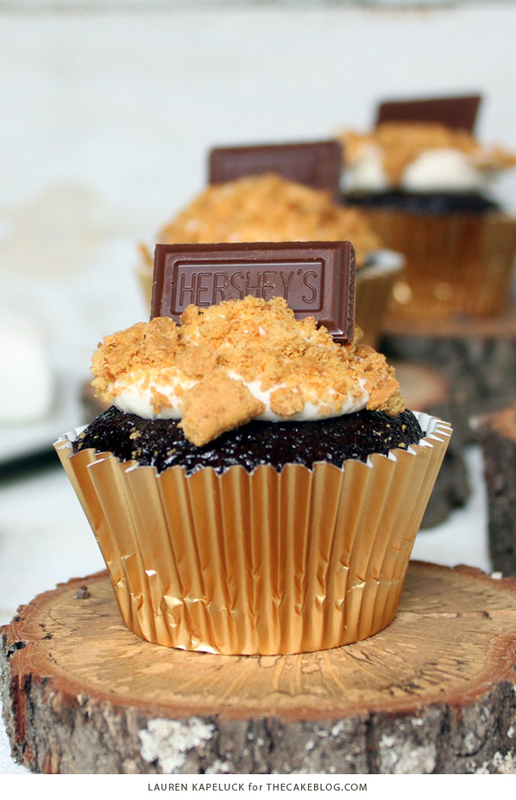 Our contributor, Lauren Kapeluck of EllenJay Events, is sharing an easy s’mores cupcake recipe! Chocolate cupcakes with marshmallow frosting, graham cracker crumbs and hunks of milk chocolate. This month’s cupcake recipe was inspired after a recent camping trip my husband and I took to celebrate our 5 year anniversary! We pitched a tent, started a fire and roasted marshmallows to create the perfect camping treat…S’mores! I can’t think of a better way to enjoy a night outside under the stars than with this gooey, sticky and messy sandwich cookie. So I transformed this graham cracker, marshmallow and chocolate combination into a s’mores cupcake that is super easy with no roasting involved. The base of the cupcake is a simple one-bowl chocolate cake. Who doesn’t love a chocolate cupcake? The S’mores factor comes into play with the marshmallow frosting and graham cracker garnish. Instead of using actual marshmallows in this recipe I decided on a jar of marshmallow cream, which creates a light and fluffy texture. This icing is not overly sweet and pairs nicely with the chocolate and graham crackers. 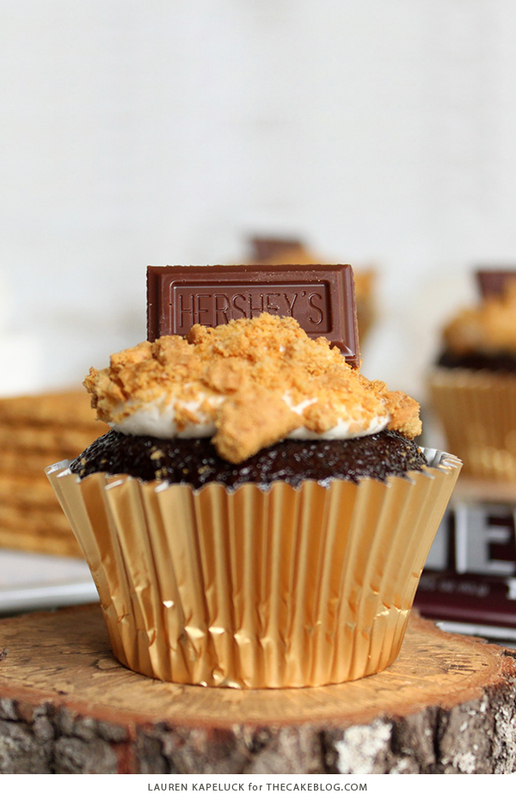 Top off the cupcake with a chocolate square from a chocolate bar and you have the ultimate s’mores in cake form! 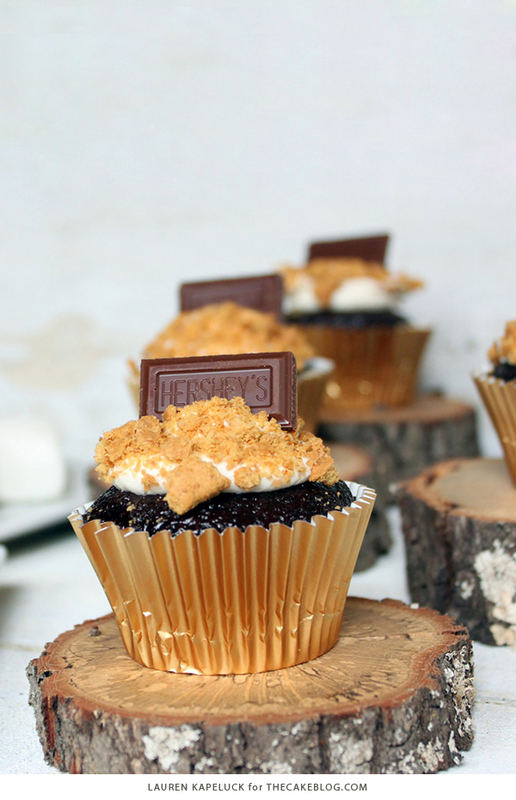 S’more cupcakes are the pefect treat for a picnic or camping themed party. They are low maintenance and super easy to make so grab your kids and get them involved. I guarantee they will love being your graham cracker crushers and dipping the cupcakes into the crumbs. In bowl of stand mixer combine dry ingredients: flour, cocoa powder, sugar, baking soda, baking powder and salt. Mix until well combined. Bake for 16-17 minutes or until toothpick inserted in center comes out clean. Once cupcakes are completely cool, ice with Marshmallow Buttercream Frosting and garnish with graham crackers and chocolate. In bowl of stand mixer cream butter for 1-2 minutes. Add marshmallow cream and mix until incorporated. Add the confectioner’s sugar and vanilla and mix until well combined. Place icing in a piping bag fitted with large round tip (I used 1A) and add a dollop of icing on top of cupcakes. Place graham crackers in zip lock bag and crush with your hands until fine crumbs. Take frosted cupcakes and turn upside down into bowl of graham cracker crumbs to cover the frosting. Place a chocolate square on top of each cupcake. 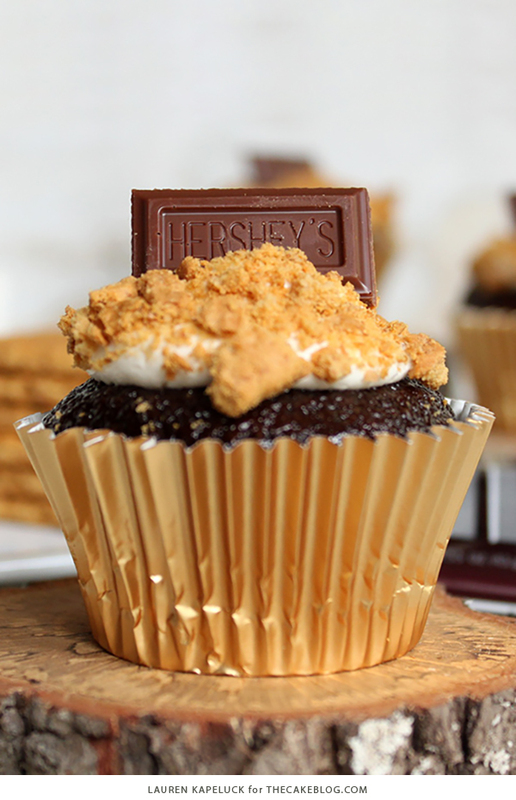 NOTE: S’mores Cupcakes are best enjoyed on the day they are baked and assembled as the graham cracker crumbs will get a little soft over time. These look delicious!! Perfect for the end of summer! Lauren, your lemonade cupcakes were so amazing, now I’m going to have to go and make these as well. Now I just need to makeup a party to go with them. I absolutely love s’mores and I have a feeling I will love these as well! Can’t wait to try! Can’t wait to try these out!! Thanks for the recipe! First many congratulations on your 5th anniversary. Thanks for that delicious cupcake recipe. Happy Anniversary! I am LOVING the tree trunks you used for the pictures, so stinken cute! These cupcakes look delicious. They’d be a perfect snack for my daugther’s Brownie Girl Scout troop. Thanks for sharing and Happy Anniversary! I made these yesterday but made some modifications- I cut the recipe in half to make a smaller batch of cupcakes, but kept the same amount of marshmallow cream & vanilla in the frosting. I topped with Hershey’s kisses, mini-marshmallows and graham cracker crumbs. Just before serving I toasted the top with my kitchen torch- the marshmallows toasted and the frosting even got that great toasted flavor. The kiss was soft, warm and easy to eat! Thank you for the inspiration! I love your blog and will be trying MANY more of your cakes!